Ahead of Samsung's Unpacked launch event on September 3rd, images of what could be the Galaxy Note 4 have been obtained by GSMArena. The photos give a fairly clear look at what might be the next large-screened smartphone from the company. The first thing to notice is the new metal rim around the edge of the smartphone, with a few breaks in the material along the bottom edge allowing wireless connectivity to function correctly. This would be one of the first times a Samsung flagship has actually used metal as part of the phone's construction, rather than faking it through metal-like plastic. The back cover appears to have retained its textured plastic, and the whole design is more rectangular than previous Galaxy Notes. Along the bottom there's also a spot for the S-Pen, a micro-USB 3.0 port and a small speaker grill. A separate leak from PhoneArena claims to show the Galaxy Note 4's box, depicting a smartphone that looks very similar to the leaked images above. If this image of the box is indeed authentic, it'll be the first release in a few generations to ditch the wooden-style packaging. 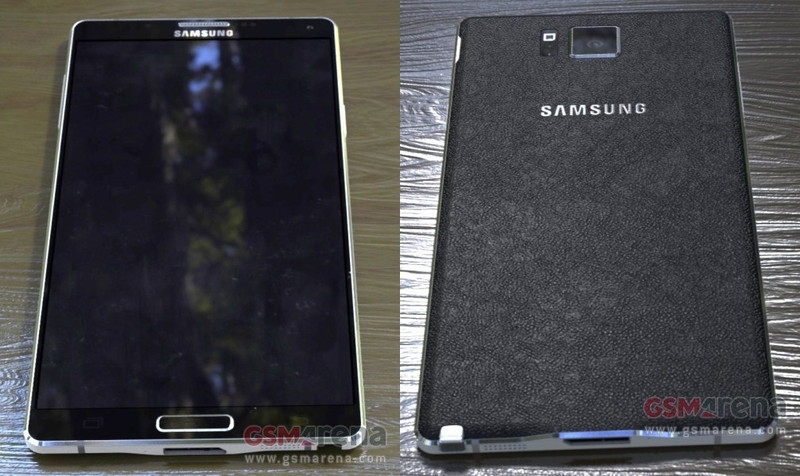 The Galaxy Note 4's rumored specifications include a 5.7-inch Quad HD display, Qualcomm Snapdragon 805 or Samsung Exynos 5433 SoC, a 16-megapixel camera similar to the Galaxy S5, and a typically-large array of sensors.